One of the first injunctions in Samuel Hahneman, the founder of homeopathy’s, great book, The Or ganon of the Healing Arts or The Organon of Medicine, is the injunction to remove obstacles to cure. In the modern world, where we live with environmental pollution within and outside of our homes, this injunction is more important than ever. Today I would like to talk to you about the subject of Grounding or Eathing and the lack thereof, in our disconnected modern lives. At the time Hahnemann lived the streets were not paved in asphalt; instead the ground in the cities was covered with compacted earth or gravel, brick, or natural stone, and people wore shoes with leather soles, or walked with no shoes at all. This natural ground cover was conductive of electricity. In our day and age, this is not the case at all: our streets are paved in asphalt, one is hard put to find earth to walk on, and grassy areas are not always accessible. The vast majority of us wear shoes with rubber or plastic soles. These man-made unnatural surfaces do not conduct electricity, and do not permit us to absorb the earth’s negatively charged electrons. Hahnemann did not have to tell his patients to ground themselves, because they lived grounded and connected to nature. We, on the other hand, in the 21st century, are not grounded. In the 1960s the plastic and rubber industry infiltrated the shoe industry and essentially took it over. Nowadays, the rubber sole shoe is ubiquitous. The problem with rubber and plastic is that these materials are insulators and do not conduct electricity. In the past when we strolled in the park or walked to work we went on a healing journey, because we were connected to the therapeutic properties of the earth, since we were not insulated from them. The earth is an infinite store house of healing negative electrons, and when we walked on it barefoot or when wearing leather-soled shoes, our bioelectric bodies absorbed those healing negative electrons through our feet. Unbeknownst to us they were reversing free radical damage in our bodies, reducing inflammation, and incrreasing the velosity and fluidity of our blood. So walking was health promoting and life giving. Nowadays walking is not the same experience. We walk on rubber or plastic shoes that insulate us from the healing potential of the earth. By not wearing footwear that promotes grounding, or walking barefoot, we are robbing ourselves of access to the most abundant resource on earth – the earth itself and its negatively charged electrons. It is not just the things that grow and develop on the earth that have therapeutic properties, but the earth itself is healing. If Hahnemann were alive today, he would say, yes, take your homeopathic remedies, eat your nutritious foods and supplements, get your exercise, meditate, but also take off your shoes, walk on the beach, or on the sand in the playground and ground yourself. Copy the animals who ground themselves instinctually, and regain your connection to the earth and its life giving properties. Grounding or Earthing is not a new discovery. People have done it, without knowing they were doing it, in all places and all times. But to us in the modern world, it is certainly a rediscovery. The man responsible for rediscovering Earthing is Clinton Ober. Clinton Ober had become a millionnaire by pioneering the Cable television industry in the 1960s. In 1993 he had a near fatal illness which caused him to reexamine his life. He sold his business, and undertook a quest to find meaning and a new purpose in life. This is what Clinton has to say, about his “aha” moment. “It all started innocently with that one simple question: “Could wearing rubber- or plastic-soled shoes, as we all do, and insulating ourselves from the ground, affect health:” From that day forward Clinton devoted his life to answering this question. He met with great skepticism, but gradually he was able to find people to help him with his expieriments, such as the cardiologist, Dr. Stephen Sinatra. The word began to spread to people in different parts of the world to whom these ideas made sense. They took off their shoes, and tried the grounding devices that Clinton developed with the help of many people. These grounding devices consist of earthing mats, mattresses, earthing sheets, electrodes and other devices to allow people to be grounded who don’t have easy access to the outdoors, or are kept inside due to the weather, or who wish to be grounded while sleeping or at work. You can watch wonderful interviews of Clinton Ober, and Dr. Sinatra with Dr. Mercola. Here are the links. The reason I am so interested in this subject of grounding is that I, like Hahnemann, feel that obstacles to cure have to be addressed, if we want healing to happen. You can take the “ideal” homeopathic remedy for yourself, and many people will experience profound healing from this, but for others even the most ideal prescription can fall short of delivering the desired optimum health. And I believe this is a good thing, because it forces us to look deeper. It is in these “failures,” that self-examination can truly happen. So we ask ourselves, why is the remedy only holding six weeks, when it should hold eight months. Is it the fault of the remedy? Let me try another remedy. Remedy after remedy is tried, but still the same results occur. Then we read about nutrition, and start eating leafy green vegetables, fermented food, cut back on sugar, and all of a sudden, the irritable bowels that we have suffered from all our lives are no longer there.. Ah! diet is important after all. Diet affects health. When I eat better, my body works better. 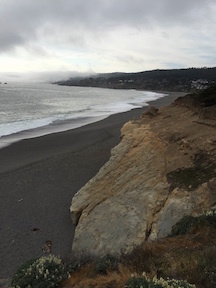 Now I am eating better, but still that vitality that I long for, that vibrancy and feeling of connectedness to nature that I experienced as a small child frolicking in the waves on the beach, is sorely lacking. So I hear about grounding. Someone tells me to take off my rubber or plastic soled shoes and walk bare-footed, or sleep on a grounding mat, and suddenly, my body feels more youthful. I am more flexible, my complexion is brighter. I am sleeping better than I ever had in my life. I was not getting these results with homeopathy alone. I had to look deeper, and reestablish my connection to mother earth to have these wonderful feelings and experiences. What are the Benefits of Grounding or Earthing? I found this list in a little pamphlet called Going Barefoot by Martin Zucker. I am quoting directly from the pamphlet. My hope in this article was to bring your awareness to another leg of the healing stool-the importance of connection to the earth, and becoming a grounded being.